We appreciate your feedback about your support experience with SkyVerge, developers of Cost of Goods. This helps us maintain high standards on the WooMarketplace, and helps SkyVerge improve. 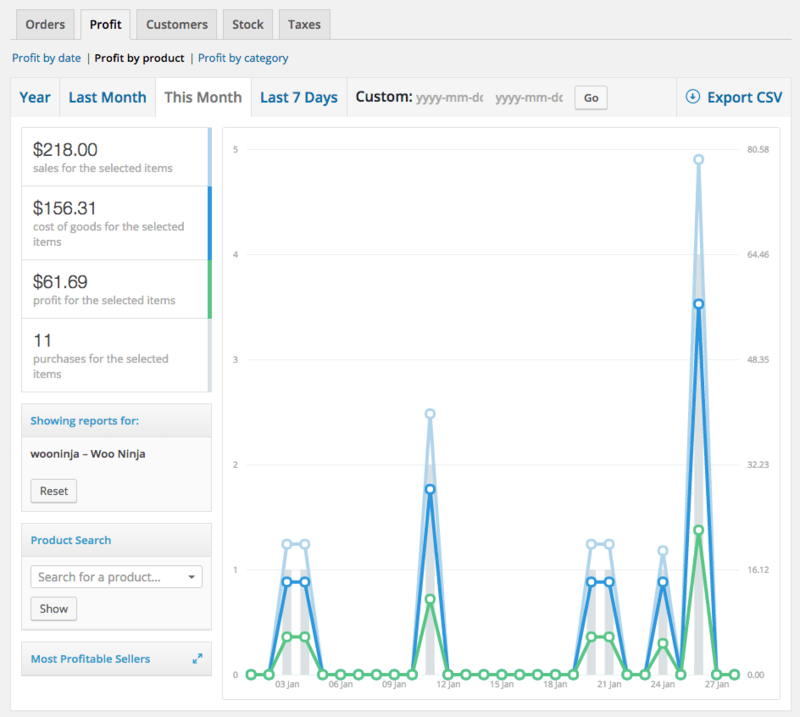 WooCommerce gives you access to great reports on revenue and top-sellers or earners. Now we’ve added Profit Reporting to make these reports even more valuable! You can evaluate not only revenue, but costs and profit all from within your WooCommerce store. Quickly and easily get the information you need to make marketing and sales decisions to optimize your store’s revenue. Easily track total profit and cost of goods by adding a “Cost of Good” field to simple and variable products. Costs are automatically calculated on checkout so that you can see your profit in addition to simple sales information, and the in-depth reports provide exactly the details you need to improve your bottom line. See a total inventory valuation based on retail prices or cost of goods. Quickly add a Cost of Good to each product, including product variations, which are then used to calculate your total order costs so that you can always know what you really earned on every order – not just how much you sold. Total costs for each order line item are saved at checkout, so even if your costs increase in the future, your total costs are always historically accurate. 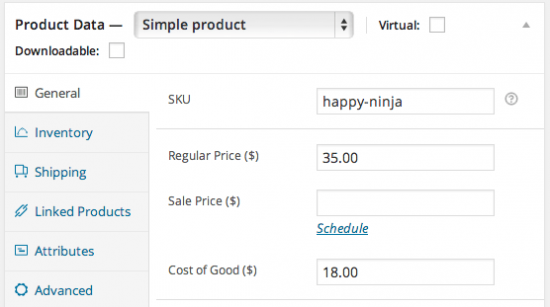 Adding costs to variable products is easy as well. You can add a default cost for all variations or set costs for a variation manually. The Cost of Goods extension allows you to determine your true top products by viewing which products are most profitable and least profitable for your store, not just those that generate the most revenue. Maybe you track pay-per-click or print advertising with the WooCommerce URL Coupons extension? Now you know which products to create these coupons for since you know which will earn the most for your store. 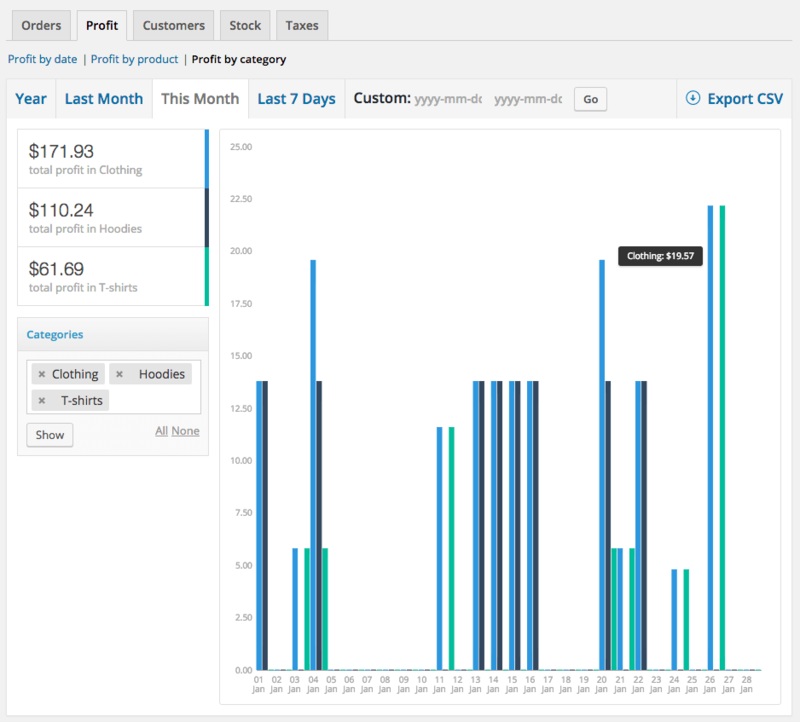 Profit by date – See your net sales, cost of goods, profit, and average profit per order for any date range. Profit by product – See your net sales for the item, total costs, total item profit, and total item purchases for the given date range. Most/Least Profitable Sellers – See the most or least profitable products for a given date range. 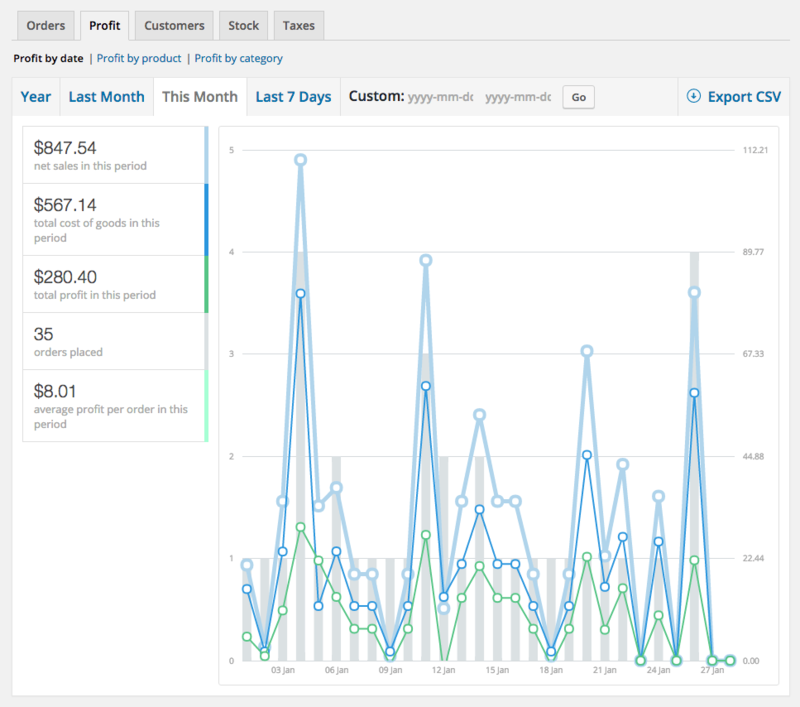 Profit by category – View total profit for any product category or multiple categories for a date range. 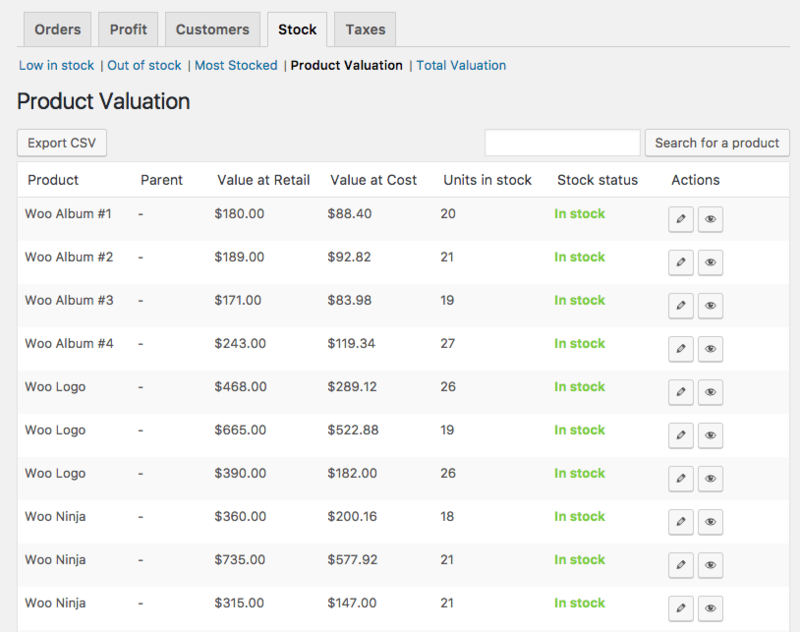 Inventory Valuation – See the total value of your inventory, calculated using the retail price or the cost of good. You can apply costs to previous orders to gain immediate insight into profitability. Simply add costs for your products, and any orders placed before using this extension can be updated from Settings > Products > Inventory to see most and least profitable sellers without waiting for new sales to roll in. That’s it! Sit back and enjoy your shiny-new Profit Reports!